Description: The Teething Ring Teddy is a cloth stuffed teddy bear with a red teething ring around her waist. She is perfet for baby's first teddy! The bear is machine washable and dryer safe to keep her clean and germ free. Designed for children ages 3 to 24 months old. FPT14417 - Teething Ring Teddy - Pretty yellow teddy bear that has red heart-shaped paws with white polka dots, and red pads on the bottom of her feet with white polka-dots. She wears a blue and white printed oval-all outfit with a yellow duck on the chest and blue shoulder straps. Teddy has a preprinted face with blue eyes, red eyebrows, a red nose, and a red smiling mouth with her tongue sticking out. Teddy is marked "Fisher-Price" in red on her back. She has a rattle inside for an added surprise. Measures about 10 inches long and 7-1/4" wide. Sold in a 6" long, 11-7/16" high, 3-1/8" deep display box. 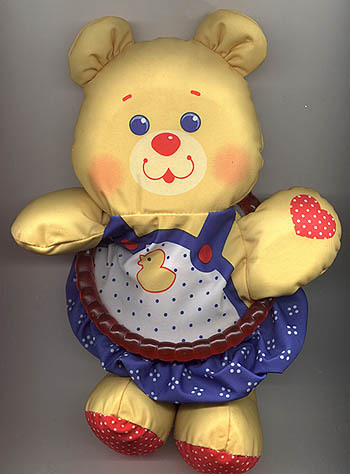 Also see the 1988 Fisher-Price exclusive Christmas ornament that features this teddy bear.